In many ways, computers do make our lives easier, but some days it’s hard for me to actually believe that. Take my computer, for example. For the past four years, it’s been no trouble at all. I’ve been able to churn out lots of speeches, articles, stories, blog posts, and started drafting novels and screenplays. I’ve read and sent emails, looked at websites, built my own website, e-communicated with friends and family here and there, organised meetings, and posted all manner of info on social media, without any interruption whatsoever. The past two months, however, my computer has been nothing but trouble. Its behaviour has seen me yell at inanimate objects to “Hurry the *$@! up,” threaten impending destruction while demanding to know “What is your problem? !”, and then, in not-so-quiet frustration, leave the room to make coffee, check the mailbox, or phone a friend while a program takes its own sweet time to load, or as emails are received one byte at a time. When you spend more time yelling at the computer than you do getting work done, it’s probably time to call in the experts. And what exactly seems to be the trouble? Oh, just a few things – “not responding” issues with programs and sites, browser and other programs opening as slow as molasses, warning notices that web pages are slowing down browsers, “send/receive error” messages even as the emails are coming through … albeit one byte at a time, background task programs running whenever the computer is idle and slowing things down even more, unidentifiable apps that prevent shutdown, text programs that stop working without warning, and most recently, single clicks of the mouse that cause two pages or two programs to open up, and emit angry pings that insist I be patient. Hello, only clicked once. I’ve run several antivirus and malware scans that have turned up nothing, regularly backed up the computer in case it’s trying to tell me it doesn’t want to work with me anymore, and made a detailed list of the various symptoms in case they pointed to something obvious. Unfortunately, despite a few suspects, I can’t diagnose anything for sure. So now, with my patience exhausted, and desperate to correct whatever ails my trusty companion, I’m taking it to see the doctor. That means I’ll be without a computer for up to a week, which will be an interesting experience in itself. At least my laptop will see the light of day, although I might just spend my time instead thinking and planning using pencil and paper. Ah, the good old days. With a bit of luck, it will be an easy fix and I won’t be too out of pocket. 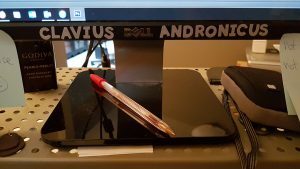 Of course, there is the possibility I will need a new computer after all, but I choose to believe that Clavius Dell Andronicus and I have at least a few more good years together. See you soon, friend … I hope.